The Asus Sabertooth line are built for toughness, reliability and thermal protection. Asus uses a battery of Military grade certification tests to ensure that their Sabertooth lineup will stand up to the toughest environments. Cased in steel from the bottom and resilient plastic shielding from the top the Asus Sabertooth is easily the heaviest board we’ve ever laid eyes on. Packed with a 5 year warranty and Asus’s Sabertooth toughness our lab smack in the center of the Sonoran Desert is the perfect place to test the board. Will the Sabertooth Roar or crawl away meowing like a kitten? Asus supplemented the expansive Sabertooth lineup with the Sabertooth X99 the most expensive of the Sabertooth clan. Included in the lineup are B85, Z77, Z87, Z97 and X99 chipsets from Intel and 990FX from AMD. The design ethic behind the Sabertooth is to provide a board that provides server level reliability and an armor like shell that helps prevent dust buildup. What differentiates the Asus Sabertooth X99 is the care and consideration Asus put into extending reliability. The Tough Armor extends across the top of the board and the back is protected by a TUF Fortifier metal shield plate. The reasoning behind the TUF Plate is to prevent bowing when heavy GPU’s and CPU coolers are attached but it also adds a level of shock resistance should the board receive some rough handling. Rumor has it that Asus considered naming the Sabertooth the “Delivery Man Special” because not even the rough package handling of delivery drivers can damage the board. When the board first arrived we heard the truck and went out to meet the driver who was dragging packages across the floor of an unmarked cargo van, no racks were apparent and no care was being given to gentle handling. The driver merely tossed packages back until he found the two that were destined for the lab. While he had his back turned we mentioned “If you don’t mind my package costs in excess of $300 I’d appreciate it if you’d treat it more like a package and less like a WWF opponent.” Sabertooth TUF extends to more than just hanging GPU’s from the board with heavy tower coolers the Sabertooth toughness extends to all aspects of board handling. We’ve heard growling from Naysayers that it’s just a gimmick. Dust isn’t a problem it’s a marketing technique. This lab is located in the Sonoran Desert and I’ve seen and lived through dust and sand storms that would send the naysayers searching for their mothers apron strings. Just to get it out-of-the-way what kind of environment the Sonoran Desert is and the different places that can truly appreciate the Sabertooth X99 watch this little video of Phoenix in 2011 and keep in mind just last year we were blasted with a dust storm so severe it deposited inches of dust and sand around un-taped windows and doors. That’s a wall of dust and sand extending thousands of feet into the air rolling across Phoenix and it happens all across the American west. The Asus Sabertooth is designed to combat conditions like that and prevent dust buildup. While your house may be fairly sealed against the dust it still gets in and carry’s an electrostatic charge so severe that propane dealers have to shut down dispensing propane and the Asus Sabertooth even addresses electrostatic discharge. Asus takes the Sabertooth series very serious and so should you, if you must have server level reliability and want the military grade certified components there’s only one place to get them and that’s Asus and their Sabertooth series. The metal backplate on the Sabertooth dubbed the TUF Fortifier is just that a heavy plate of metal strapped against the back of the board with a little breathing space. Overkill perhaps but if you’ve ever seen a board bow from a heavy CPU cooler or a couple of Nvidia TItans the Sabertooth will stand strong and not bend. Asus claims that the backplate can reduce board temperatures as much as 6°C by use of a thermal pad that whisks heat away from VRM and other vital components. OK, you win if you live in the Sonoran desert you need dust covers. But if not, it is a gimmick. I have filters on my case for that purpose. The Sabertooth is a board designed for extreme conditions not your average every day user. It’d dust covers and prevention measures will be of some help but limited help. It just happens to be about the only option for extreme conditions. I’ve worked on machines that came back out of the Gulf War(s) laptop and desktop and you work on them sitting on a tarp because sand and debris will be pouring out, you take them outside and hit them with filtered compressor air. 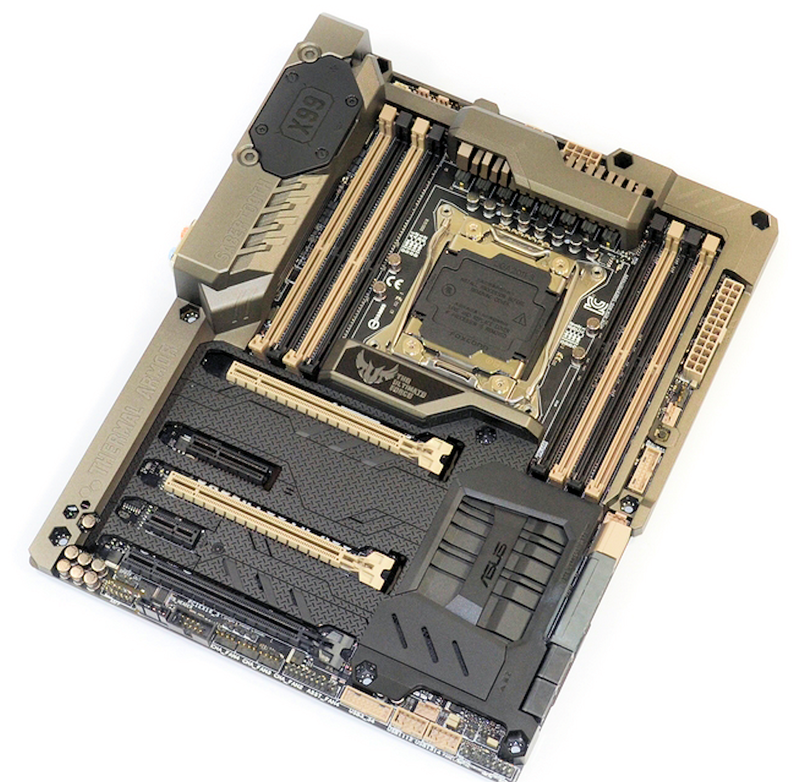 There’s a place for the Sabertooth it might not be your house but it’s one of the favorites of harsh condition motherboards and does in fact outlast other unprotected boards. If your not in that environment then buy an alternative by all means, if you have dust, spider web or other conditions like not planning on blowing the dust out every 6 months then maybe the Sabertooth is for you. 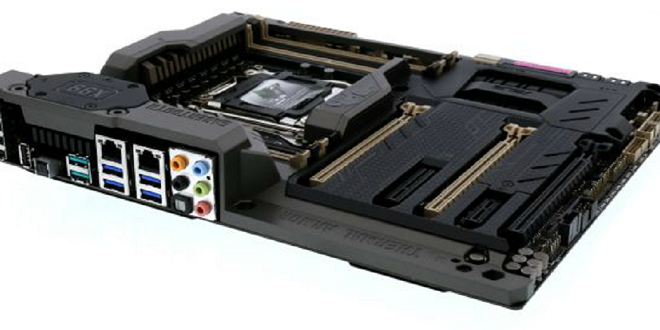 The Asus TUF Sabertooth X99 is a one of a kind durable motherboard backed with a 5 year Warranty. The Sabertooth OCs fairly well if a bit finicky and a few compromises have been made to make it TUF but if TUF is what you need then the Sabertooth X99 is your board.